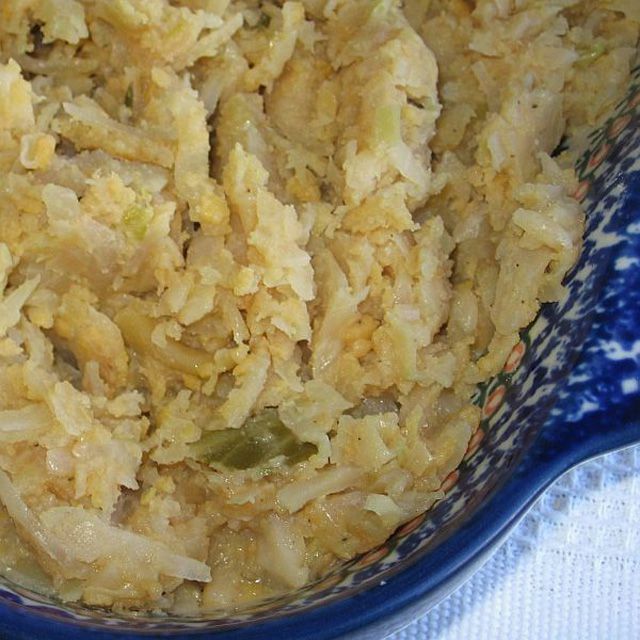 Split peas and cabbage, or kapusta z grochem (kah-POOSS-tah zih GRROH-hem) in Polish, is a traditional side dish at wigilia, the Christmas Eve dinner also known as the Star Supper. Fresh shredded cabbage, sauerkraut and a purée of cooked yellow split peas are combined to make this thick, slightly tangy dish. While wigilia is a meatless meal, this dish, which is as much a starch as a vegetable, also can be served with a garnish of pork cracklings known as skwarki or fried bacon if you're not fasting. Combine peas and boiling water in a small saucepan. Bring to a boil over medium-high heat and continue boiling 2 minutes. Remove from heat. Cover and let soak 30 minutes. Bring to a boil again. Reduce heat to a simmer, cover and cook 20 minutes, or until cooked down into a purée, adding more water if necessary. Remove from heat and set aside. Meanwhile, in a large pot or Dutch oven, place shredded cabbage, sauerkraut, and 3 cups of water. Bring to a boil. Reduce heat to a simmer, cover and cook 1 hour. While cabbage is cooking, sauté onion in butter until golden brown but not burned. Set aside. Add cooked peas to cabbage mixture. Season to taste with salt and pepper. Add some kraut juice or vegetable broth if too dry. Add sautéed onions and mix well. Heat until warm throughout and serve. Optionally, sauté onion with chopped bacon, omitting the butter, until bacon is cooked through, but not crispy. Add to cabbage with cooked peas.